For a long time, the MP5 was the SWAT firearm we all lusted after. For a brief time, the MP5 in 10mm was the Holy Grail of HK ownership, and anyone who had any aspirations of being the apex gun owner at his gun club schemed to lay hands on one. Alas, that was not to be. A bit of backing up is required here. The FBI, after the Miami shootout in the 1980s, decided that it just had to have side arms chambered in 10mm. It moved heaven and earth. It sandbagged more than one gun company to get what it wanted, and one of the brighter ideas the FBI had was this: it would be very clever if, when next FBI Special Agents locked horns with bad guys, like in Miami, they had long guns chambered in 10mm as well as side arms in same. Strictly from a supply issue, having handguns in 10mm and subguns (MP5s) in 9mm was not wise. So, the FBI approached HK to have the latter build the MP5 in 10mm. What that took, we may never know, at least on the inducement side of things. On the engineering side of things, we do have a much better idea of what it took. To repeat the obvious, the MP5 is a delayed-blowback, roller-locked sub-machine gun, chambered in 9mm Parabellum. It was the obvious follow-on to the West German G3, that one chambered in 7.62 NATO, and MP5 production began in the mid-1960s. Here in the US, HK firearms and clones of them had been imported for some years up through the 1980s. These included the HK-91, HK-93 and HK-94. These were made in 7.62 NATO, 5.56 and 9mm, respectively, and came here as semi-auto rifles and carbines. 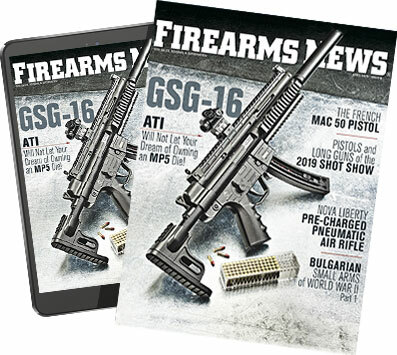 The select-fire versions were offered only to law-enforcement agencies, but there was, before the addition of the Hughes Amendment in 1986, a brisk trade in the conversion of semi-auto rifles and carbines to select-fire, once the paperwork was approved. Those conversions took the form of a "sear pack," which was a trigger assembly converted to select fire. The 10mm (and the .40 S&W) came onto the scene after the first barrage of import bans, and as a result, they were never offered here as semi-auto carbines. The only versions to be had were the ones made for the FBI, or sold to other law-enforcement agencies. When those were deemed surplus, the usual fate was to be torched, as few police administrators were keen on "selling machine guns to the public." A very few have found their way out of police armories, but they are rare. So, if you want a 10mm roller-locked pistol or carbine, for all this time you were out of luck. Well, you're out of luck no more, as Atlantic Firearms has expanded its universe by offering the Omega-built 10mm roller lock. The original Omega is identical to the MP5 semi-auto pistol, and for its next "bravo" moment, Omega has added the 10mm version of the Omega to its line. The Omega 10 begins life as a heavy-gauge sheet-steel "flat" that is cut out of a roll of the appropriate alloy and thickness. This flat is then pressed over forms and welded together as a receiver, in the same process that was used by the West Germans when making MP5s. The welded receiver also has the rest of the parts needed included and attached, such as the cocking tube, barrel, and the various blocks of steel — like the barrel trunnion — that constitute the finished receiver. Most of these are made in the USA, and the end result is a handgun that fully complies with the 922r requirements. There are some small parts that come from West German imports, such as the takedown pins. One detail I found of great interest is that, where the basic MP5 design had been upgraded, the Omega follows. So, the receiver is the latest iteration of the MP5 receiver, as is the cocking tube and cocking handle. Nothing that could be made to the latest design was left behind. This included the bolt hold-open lever, a part not found on the 9mm versions. In fact, none of the HK roller-lock variants, the 91, 93 or 94, had a hold-open; it wasn't something the West Germans wanted, but it was something the FBI wanted. One detail that I found quite interesting was the trigger group. The trigger housing is a West German "SEF" housing. This is the Safe/Sicher, Semi/Einslefeuer, Auto/Feuerstoss select-fire housing that would be on an MP5 that went rock n' roll. It is disassembled, and re-built to be a semi-auto-only assembly, and despite the lever going over to full auto, the result is still semi-auto. You get the look, but not the cost. What is also an exemplary attention to detail is the "takedown pin." It isn't. When HK was importing its rifles into the United States, it was required to modify the receiver. Instead of the dual push-pin trigger housing of the select-fire, the imported semi-only receivers used a rear takedown pin, and the front of the receiver and housing had to be modified to only use a latching shelf. As a result, the select-fire trigger assemblies, using two push pins, could not fit onto a semi-auto-only rifle that had been imported. When the converters were making select-fire models from the imports, they modified the semi-auto trigger housings, and as a result, a correctly made registered sear pack, which has one pin and the front shelf, will work on the Omega 10. You lucky dogs, you. The modified Omega trigger assembly looks like a two-push-pin assembly, but the front pin is a fake, keeping your Omega on the right side of the law in construction, but looking like a select-fire housing on the outside. Lucky us. The trigger pull? The polishing Omega did in the conversion improved the typically wretched HK trigger pull. The Omega 10 had an eight-pound pull, with lots of travel, but that is a marked improvement over the factory original. Ahead of that is the magazine release paddle. This is the current no-rattle German paddle release. The top of the receiver has the correct profile for an optics mount, so if you are a lucky owner of a German optics mount, it will clamp on just fine. At the back end of the receiver, Atlantic has installed a flat-plate rear cap. This is a handgun, after all, and the plate must preclude installing a stock. It does, however, have a pair of sling attachment holes, where you can easily clip on a single-point sling. With a single-point sling attached, you can shoot it SAS-style, where you adjust the sling so it pulls up taut just as you get the firearm fully extended. Or, you can install an arm brace from SB Tactical. To install the arm brace, simply press out the rear pin, pull off the end cap, slip the SB Tactical arm brace on (make sure the trigger assembly hasn't shifted) and then push the takedown pin back into place. Not only is the SB Tactical arm brace a useful brace, it folds for easy and compact storage and comes with a sling swivel loop built into it near the hinge, in case you want to attach your sling there. Out on the muzzle, the three-lug mount is also dimensionally correct, and the lugs are oriented properly, with the top mount at 12 o'clock. Last but not least, the front and rear sights are correct German sights. All of this U.S.-made Germanic glory has been given the correct finish. The steel is parkerized before receiving a gloss black epoxy paint finish. And, as a joyous discovery, when I opened the package, I found an HK polymer 10mm/.40 magazine in with the handgun. So, the question to be asked was: what ammo would work? Quick answer: all I had to test. Now, an MP5 is not exactly a lightweight pistol-bullet launcher. I was not expecting any problems in felt recoil, nor were there any. I was expecting some disagreement over the "correct" load, given that there was just the factory locking piece in the bolt, and I had none to swap out, should one be needed. I need not have worried. The Omega 10 cycled properly even with a relatively soft load and did not hurl the brass into the next range with a hot load. The MP5, as have all the HK roller-locked firearms, has a fluted chamber. The bolt does not rotate, it only moves straight back and forward. This means it has no primary extraction to break the case adhesion to the chamber walls after firing. To ensure the brass was not ever going to stick to the chamber, HK fluted the chamber so propellant gases could flow back in the small grooves of the fluting and reduce the chamber-wall adhesion of the case. Fired empties from the Omega 10 showed the distinctive scorch marks, so all was well there. The chronograph work was just plinking and writing. Shoot ten rounds at the hill, at my aiming spot, record the velocities, reset the chrono, and repeat with the next load. The accuracy results were more work. First, I had to adjust my usual shooting position to accommodate the magazine. The regular bench rest would not work, and I ended up having to reverse the rest, place it near the back edge of the table, and use it for the forearm alone. For the rear, I had to depend on my elbow resting on my knee, with my foot on a box, to get the heights correct. As a bench rest technique, it can be recommended only in that it worked. The accuracy results were interesting. The Omega 10 clearly wants to shoot small groups. However, the sights don't help, and the trigger is everything I'd expect from an HK rifle, carbine or derivative. The ring-in-a-ring with a front-post HK sight design is probably fast and accurate for someone, but it is only fast for me. If I dial down to the smallest aperture, it is more accurate, but a lot less fast. And the trigger didn't help, but as mentioned, it could have been worse. One of the design and test requirements that the West German army laid down was that the rifle (or the MP5) survive a twenty-five meter drop, with the safety off, and not discharge. There's a lot of movement in there, mitigated by the polishing that Omega has done in the trigger assembly rebuild. I tested at fifty yards, mostly because I didn't want to walk the full 100-yard distance on our club's rifle range, but also it seemed in keeping with the intended use of the firearm. For those who might think the groups were a bit large, the average group width was not any wider than the apparent width of the front sight, which is pretty darned good for any firearm aimed with iron sights. The Omega 10 is certainly a well-made firearm. If you are looking to get a roller-locked firearm in a caliber bigger than 9mm, or you want to have a clone of the rarest of the rare, then this is just the ticket. One application comes readily to mind: a truck gun. The 10mm has never been a slouch when it comes to barriers. If you are worried about performance on barriers, you can load up full-weight FMJ ammunition and do as well as any handgun cartridge is going to do. The Omega 10 is going to give you more reach than a handgun would, and in a very controllable package. Modern barrier-blind ammo will still expand once it gets through incidental objects, and with the mild recoil, you will be able to get lots of hits on target in short order. In other words, an eminently suitable tool for solving your emergencies. First, unload the Omega. Then, press out the rear takedown pin on the trigger assembly housing. Remove the end cap (or arm brace, if you have installed that useful accessory). Pivot the trigger housing down slightly, and then pull it to the rear. The shelf it hooks onto is not very large, so you will find the housing easy to remove. Grasp the recoil spring assembly and pull it out of the receiver. Hold your hand over the open end of the receiver and tilt the receiver back, and the bolt assembly will slide out, into your hand. It is not light, so don't just turn the receiver upside down. That's as far as you need to go for regular cleaning. On reassembly, slide the bolt assembly into the receiver, and tilt the receiver to let it slide to the breech. Insert the recoil assembly into the rear of the bolt assembly. Hook the trigger housing on the receiver shelf, pivot it up, and press it forward until the notch in the housing lines up with the takedown pin holes in the receiver and the arm brace. Press the end cap (or arm brace) over the receiver and insert the takedown pin through the lined-up holes.